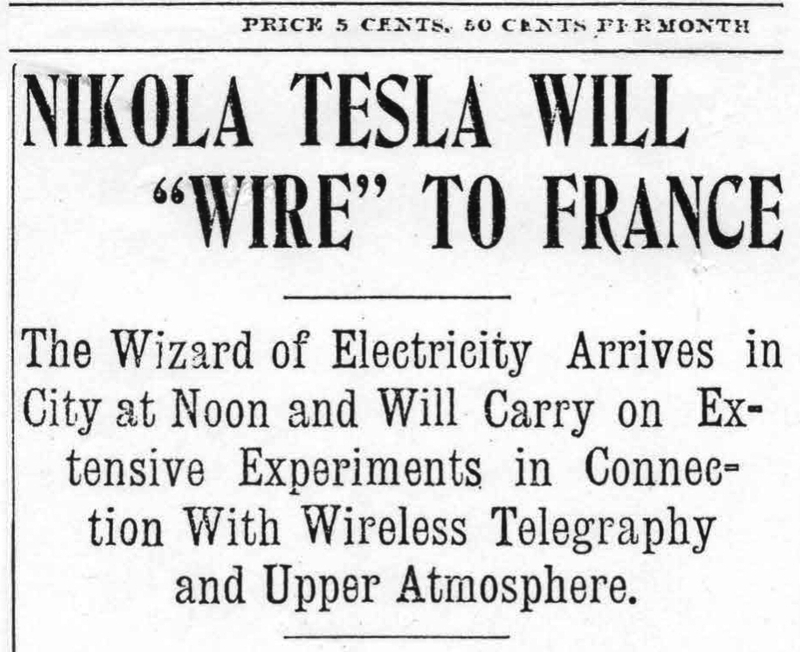 Nikola Tesla arrived in Colorado Springs, Colorado on May 16, 1899 to establish an experimental station and conduct research in the budding field of "wireless telegraphy". Upon arrival he quickly lodged at the now long-gone Alta Vista hotel which was at 112-120 N Cascade Ave., on the west side of Cascade, between Bijou and Kiowa. 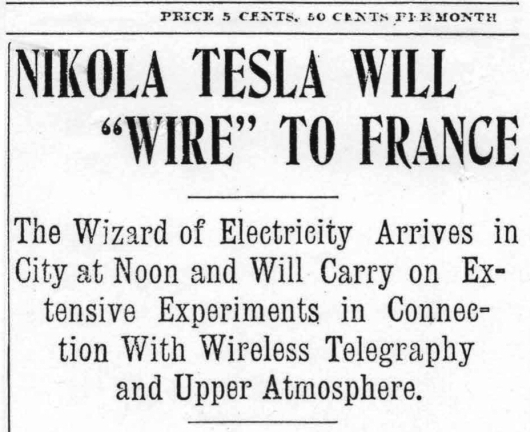 With the help of some land procured from W. S. Jackson, just east of what at that time was the city limits, Tesla would build his lab. 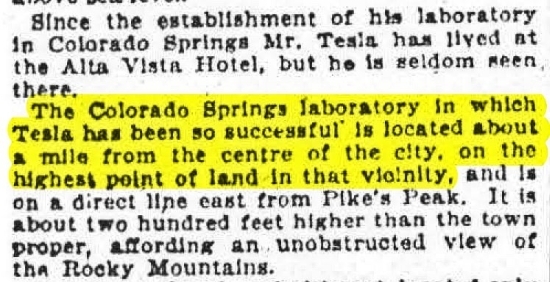 Unfortunately, Tesla was only in Colorado for about 9 months running his experiments. Circumstances changed the direction of his efforts and he virtually abandoned the Colorado lab he called his "Experimental Station". He was sued in 1904 by the Colorado Springs Power Company, and by a former employee for back wages, and the lab was never used again. 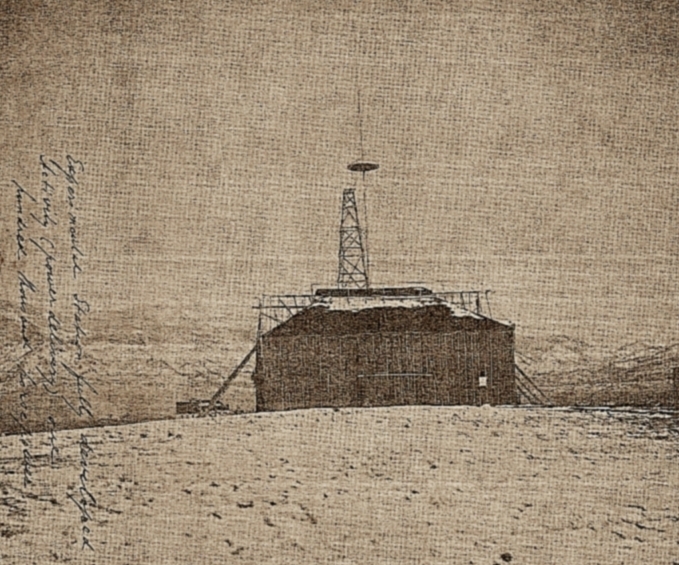 Here is an undated photo of the lab - Nikola Tesla's Colorado Springs "Experimental Station". This view is of the West-facing side. 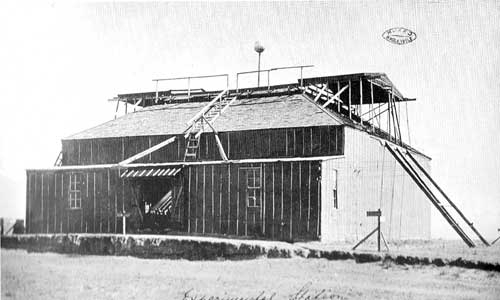 Though undated, it is circa late 1899-1900 as the pole and ball in the middle of the roof appears to be an early configuration and the lab was torn down in 1904 and sold for scrap. The lab, and its location fell into memory and was forgotten. 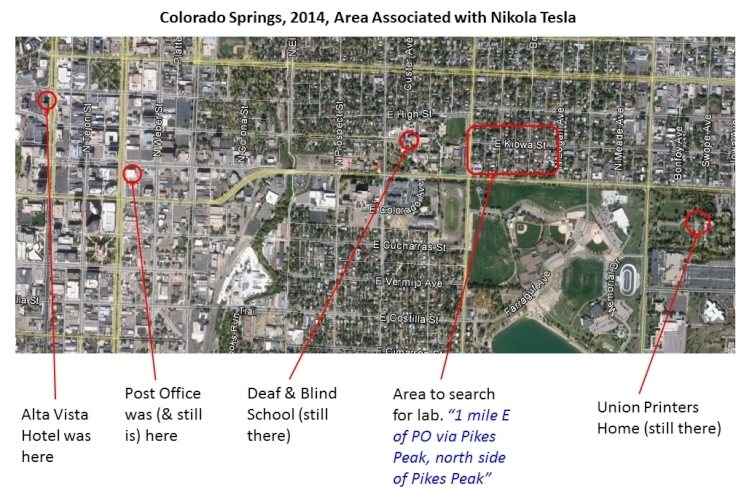 Many accounts explain that the lab was located "east of the Deaf & Blind School", or "between the Deaf & Blind School and the Union Printers Home", and "North of Pikes Peak Ave." Maps of the era show the Deaf & Blind School, and Prospect Lake, but not the Union Printers Home as it was located outside the city limits when the 1900's period maps were made. Further, while no housing existed east of the Deaf & Blind school, the land had already been platted for future city growth and maps showed these future streets, in reality, it was just empty prairie and no map showed any hint of Telsa's lab location. And over the years a few have looked into the location of the lab and have rather placed it within approximately one city block. Indeed an article in the Colorado Springs Gazette Telegraph dated Oct 12, 1983 ignored all the evidence and cited the location as possibly "the southeast corner of Institute Street and Pikes Peak Avenue." Another article in the Colorado Springs Gazette Telegraph dated Aug 11, 1984 placed the lab location at the "southwest corner of the intersection of Kiowa Street and Foote avenue." Both of these locations are wrong because key information was ignored or not known. One of the most sound investigations into the location of the lab I found was by the Pikes Peak Library District, Library Channel TV. In an undated 42 minute video investigator Kevin Hudgins looks at the evidence and concludes that the lab was on or very near the southeast corner of Kiowa and Foote. The video is entertaining and gives the viewer good insight into all the clues. 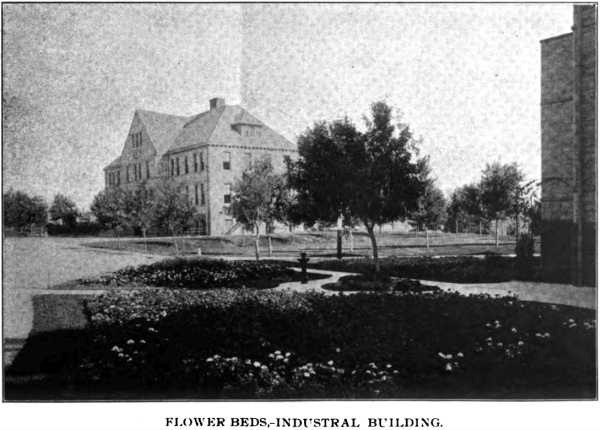 This photo is most useful because not only does the Union Printers Home still exist, but the dimensions of the original building are well-known, and the original structure is easily still seen today, even in overhead imagery from Google Earth. 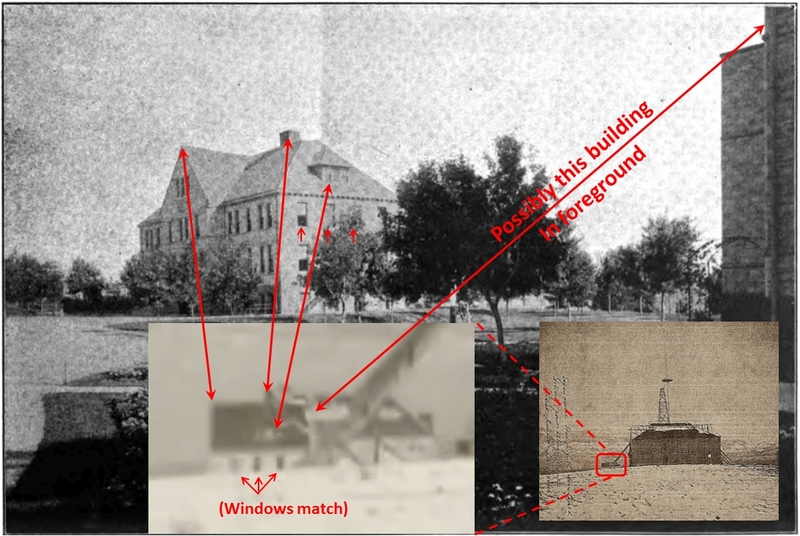 Making solid estimates of the angular resolution of the original of this photograph, and knowing the dimensions of the Union Printers Home, significantly aids in the identity of the location of the Tesla lab. We see from the Tesla Lab photo shot from the east that the perspective is very close to straight along and parallel to the front of the Industrial Building. 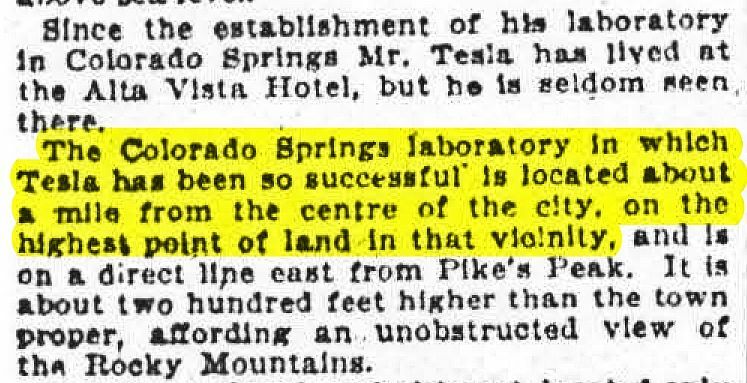 3rd, A citation in the Nov 12, 1899 New York Herald says: “The Colorado Springs laboratory in which Tesla has been so successful is located about a mile from the centre of the city, on the highest point of land in that vicinity, and is on a direct line east from Pike’s Peak. 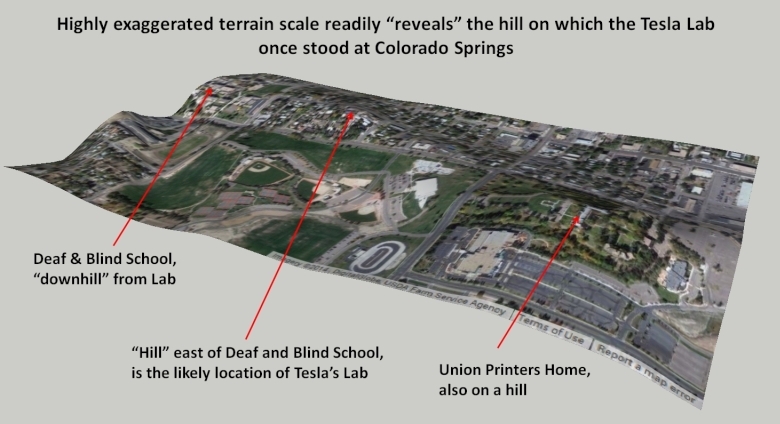 It is about two hundred feet higher than the town proper, affording an unobstructed view of the Rocky Mountains.” Thus we know Tesla located the lab on the highest point of a hill. 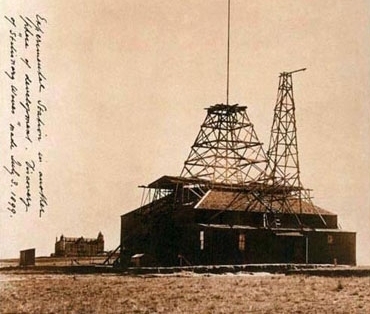 We can be sure he did too as his experiments had to do with electricity in the atmosphere and being a scientist, he would not overlook getting his antennas as high as he could using the natural terrain. The map-tack is located at (Lat Lon) 38.834177 -104.800065. The hill, in fact, is quite pronounced. If you ascend the hill from Pike's Peak Ave., north, along Foote Ave, the hill climbs rapidly 20 feet higher by the time you reach Kiowa street. Less noticeable however, is that the actual "peak" of the hill is to your east, as you near Kiowas St. 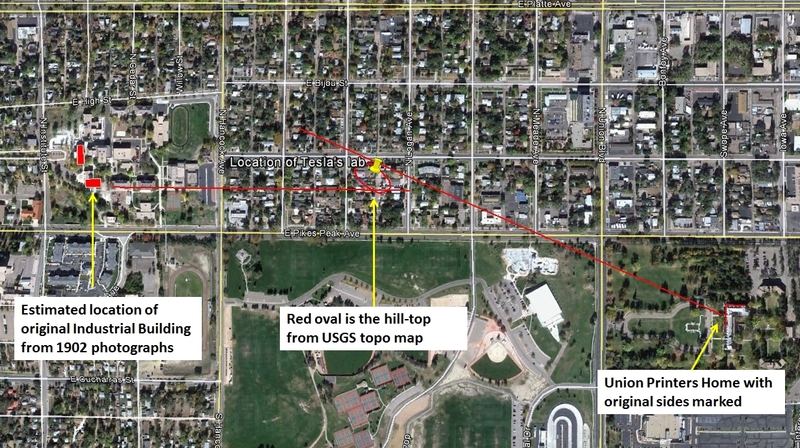 This is "discovered", despite the homes present today, by turning east on Kiowa, then back to the south through the alley between Foote and Logan Ave. As you turn onto this alley, you climb another 10 feet or so by the time you reach the "peak" (map-tack in the red oval in the photo above). On this spot, you have the distinct "feeling" you are actually at the spot where the lab once stood. There is no doubt Tesla would have placed the lab at the highest spot, and it turns out that the highest spot is rather easy to discern! To emphasize that this is the highest spot east of the Deaf & Blind School, the following graphic is the geospatial data plotted in SketchUp with the elevation highly amplified. Assuming Tesla did locate his lab "on the highest point in the area", then the lab had to be located at this point. There is no chance to study this area closely or to do any "archaeological digs" to discover artifacts as the area is now entirely residential. At the actual site of the lab, any evidence of its existence has been lost to time. There is a wonderful bronze historical marker on the south side of Pike's Peak Ave, between N Sheridan Ave., and N Foote Ave. 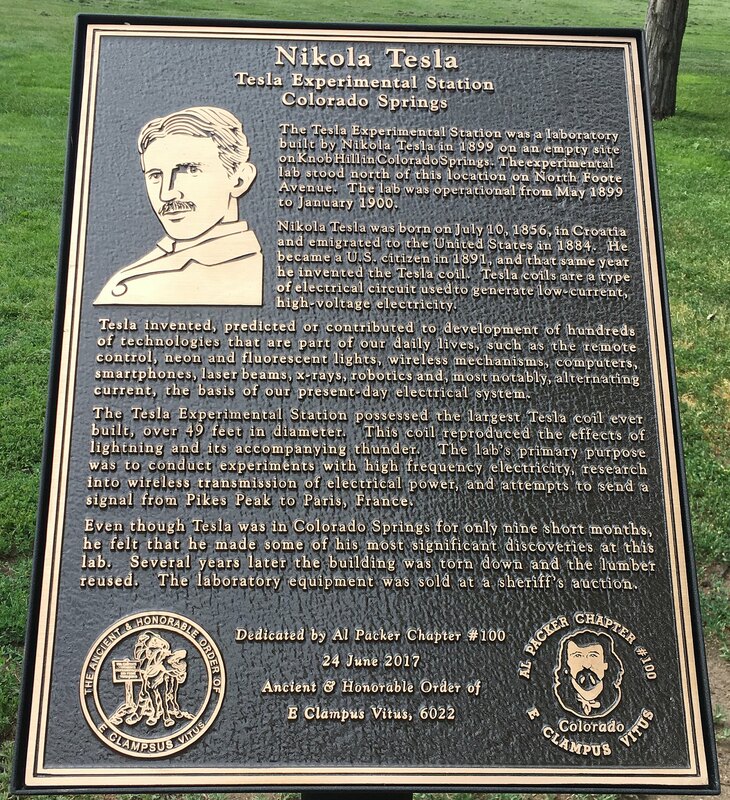 It is a fine plaque commemorating Nikola Telsa dedicated on June 24th, 2017 by the Colorado chapter of the E Clampus Vitus. The original commemorative marker at the same spot was destroyed in a violent wind storm in January, 2017. Click on the photo above for a larger version to read the inscription.